creeping perennial that is only hardy in USDA zones 9-12.
in combinations of white, pink, purple, yellow, silver or green stripes. Wandering Jews make an excellent evergreen, drought resistant, ground cover plant for growing in full sun or partial shade. In the home, Wandering Jews are most often grown as a hanging plant, but they can also be trained to grow up a small trellis or used to create a topiary statue. 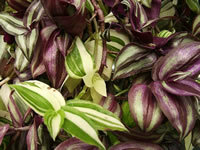 Wandering Jews grow best when they are exposed to in full sun or bright, indirect light. Water moderately but regularly, keeping the soil evenly moist when this plant is actively growing. Allow the soil to dry completely before watering during the dormant cycle. Feed monthly while growing, with ½ strength house plant food.. When your Wandering Jew begins to get leggy it can be cut back as severely as necessary. 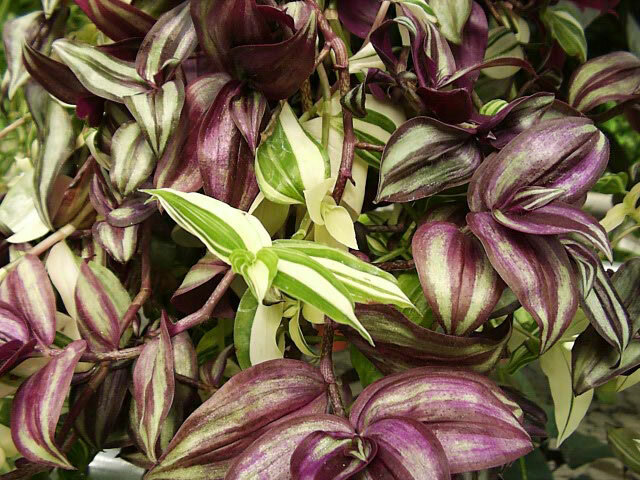 Wandering Jews are very easy to propagate with 4"-6" tip cuttings struck into soil or kept in a glass of water, or by simple layering. Layering is easily accomplished by pinning the stem onto the surface of a rooting medium. Roots will grow at each point where a node is in contact with the medium. Once rooted, each node will produce a new plant that can be severed from the parent plant and planted in its own container.